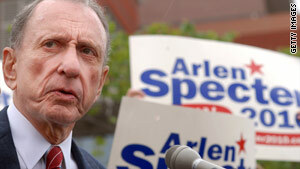 Sen. Arlen Specter lost his primary battle even though he had President Obama's backing. Washington (CNN) -- CNN Political Editor Mark Preston looks at what Tuesday's primaries could say about the rest of 2010. A Democratic governor and Democratic gubernatorial candidate fell in November, the late Massachusetts Sen. Edward Kennedy's seat went Republican in January, and now Sen. Arlen Specter has lost a primary battle even though he had President Obama's backing. What does this mean for the Obama endorsement? Do Democrats want his help in November? Of course, it just depends on who, when and where. Obama still can energize the black and youth vote, and now the big question will be -- can he excite the people who voted for the first time in 2008? Liberals pumped money and support into Arkansas Lt. Gov. Bill Halter's primary challenge of Sen. Blanche Lincoln. Halter didn't win but forced Lincoln into a runoff. The draw on Tuesday is considered a win by Lincoln's liberal opponents, who view it as an affirmation that this two-term incumbent didn't have the muscle to win a third term. All eyes turn to the June 8 runoff and beyond. Other centrist Democrats must be concerned that they could be next. The Tea Party can take full ownership of Rand Paul's landslide win over Trey Grayson in the Kentucky Senate Republican primary. Now what is next? The Tea Party is not an actual political party, but rather it is a decentralized movement. Can Tea Party activists from around the country all come under one tent? After all there is strength in numbers. Or do they prefer to keep the status quo?